2.5 bath, 1,900 sq. ft. villa! 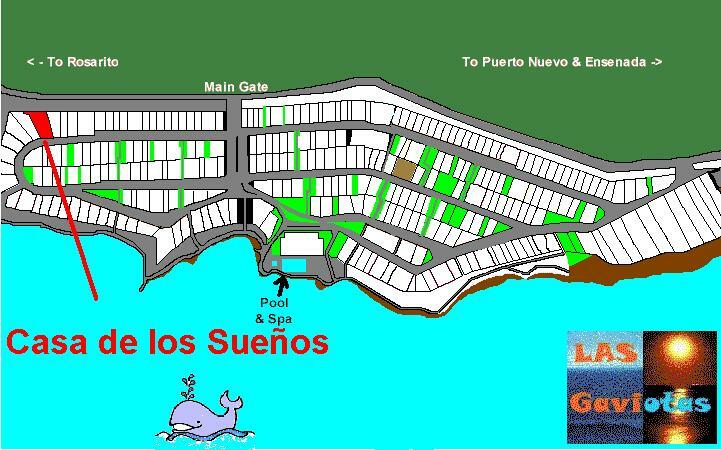 Experience the magic and romance of Casa de los Sueños, (House of the Dreams). Comfortable seating to relax and unwind. 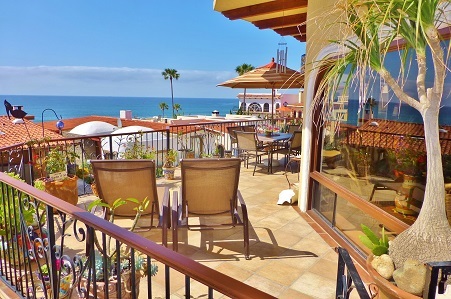 Whether relaxing on our large terrace, lighting the BBQ, or preparing your favorite dish in our cocina, your eyes will feast on the sweeping views of Baja’s glorious coastline. The sound of the sea soothes your soul and lulls you into dreamland. Siesta anyone? Plus, the “Garden of Ian” is filled with stunning plants, flowers & hummingbirds just waiting to meet you! THERE’S SO MUCH TO SEE AND DO … YOU MIGHT AS WELL STAY A WEEK! US Currency, Cashiers/Personal Check or Money Order, prefer PayPal. $200 per night/2 night min./ $55 maid fee/$250 sec. dep. Security Deposit will be returned if no fines or damages. 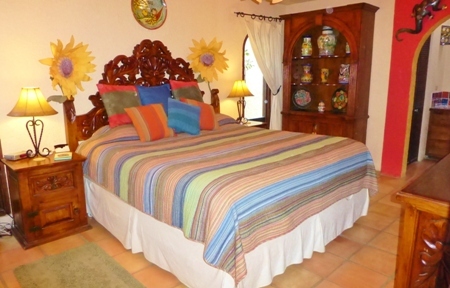 Spring Break, March 16 – April 8, 4 nts / $225 per nt. 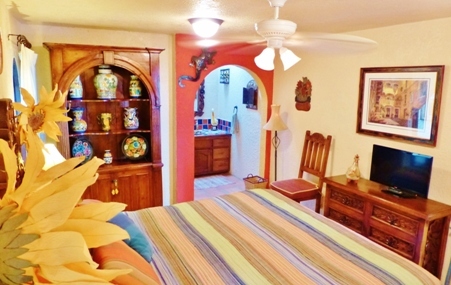 Memorial Weekend, May 25-27, 3 nts /$250 per nt. 4th of July, June 29 -July 7, 7 nts /$225 per nt. Labor Day Weekend, Aug 31-Sept. 2, 3 nts / $250 per. nt. Thanksgiving: Nov. 21-25, 4 nt. min / $250 per. nt. Presidents Weekend, Feb 15-17, 3 nts / $225 per. nt. Occupancy 5. Parking for two cars. Cancellation Policy: Your deposit assures you that your reservation will be guaranteed and confirmed. Should a cancellation be necessary 14 days or more before your scheduled arrival date, a full refund of any deposit money paid will be granted (less a $100 service fee). HOWEVER, should a cancellation be made less than 14 days prior to the scheduled arrival date, any deposit money paid will be returned ONLY if our home is rebooked. The service charge as stated above will still apply. We believe that a reservation is a contract between all parties. We guarantee our home for you and you guarantee you will arrive. 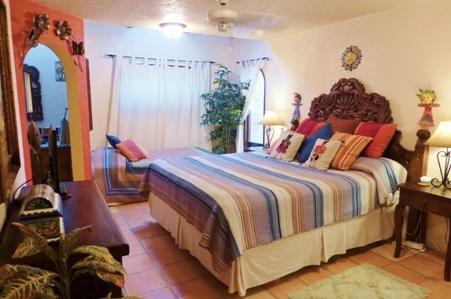 Private home rentals establish policies that may be quite different than major hotel chains. Our home is smoke-free – thanks for your co-operation. Sorry, no pets allowed in Las Gaviotas. Check if your dates are available. 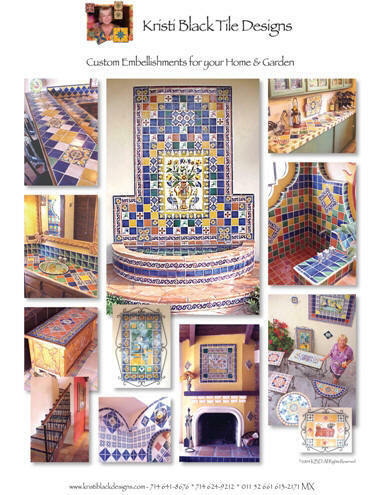 It would be my pleasure to enhance your casa with a custom, decorative tile design. Each tile has its own personality -each tile welcomes you home. What a beautiful host and hostess you are! 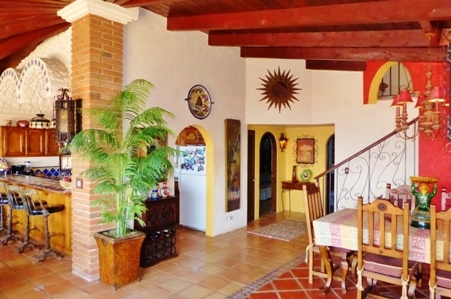 Your home (casa) so perfectly expresses who you are! This was such a blessing to us to spend our 25th wedding anniversary here! We plan on coming back often as this is truly our home away from home. We look forward to staying here with family and friends. You are truly remarkable Kristi! Thank you for creating a masterpiece. Every design detail is has been exquisitely conceived and executed. You’ve created the ideal psychic and physical space. We melted into the space for two days and emerged renewed. 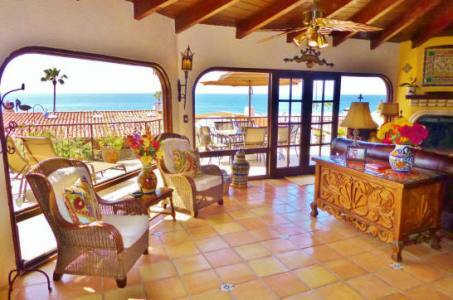 Tequila, sun, tortillas, sand, hot tub, a beautiful view and your amazing hospitality! A perfect week! Thank you! As one goes through life, you discover that experiences are more precious than items. It is this very notion that permeates Casa de los Sueños. Your home has filled lives with memories, laughter, tranquility, love and many other feelings that bring back our individual centers. You have filled a space with love and sent it along to all that stay. We are grateful for these moments and memories here and are eager to return. On behalf of Teresa, Mike and Carmen – Much love and gratitude! When my friends and I walked in the door of your home we were blown away by the beauty of your place. It was so nice that we had to show the house to all our friends who were staying in Las Gaviotas for the wedding we attended. Thank you for renting out your lovely (and very comfortable) casa. I hope to be able to stay there again sometime in the future. You have a beautiful home. The views are spectacular! Your home is so comfortable and my husband and sons couldn’t get enough. We feel we got very lucky! I can’t wait to return and spent more time in your wonderful home. 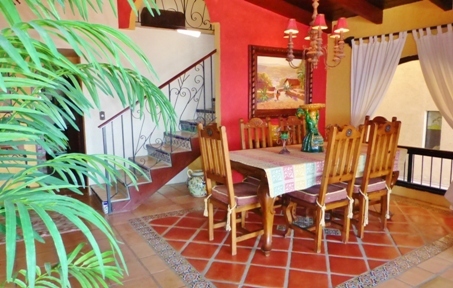 You have found a precious gem with this house and location. What a fine week this has been! We love the artistic ambiance you have provided us this birthday weekend. We had a wonderful and relaxing time. This will definitely be a place for us to return many times in the future. Thanks for the great memories! Thank you for sharing your beautiful home with us. The kids loved the video library. I loved the balcony with your wind chimes and plants. You have done a great job providing everything a person/family could want. As fellow interior designers, we were impressed by the creativity that went into your beautiful home! Every little detail gave us clear insight to the work and effort you gave. Thank you for opening your home to us. We will be back soon! We had a great time – nobody wanted to leave your wonderful house! 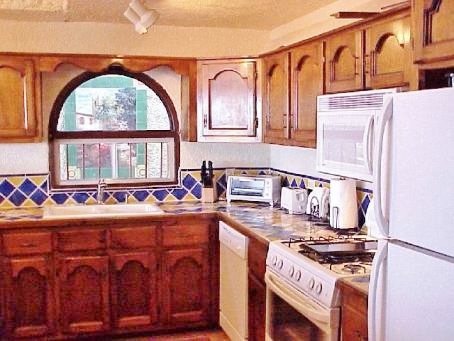 We all admired and loved your tile work, furniture and decorating, Kristi. What a difference from our friends house down the street – no comparison!! Thank you! Thank you for allowing us to stay in your beautiful home. We are already planning our next visit. The view was absolutely breathtaking with one of the best sunsets I have ever witnessed! New microwave, 5 burner range & oven, new dishwasher, full-size refrigerator/freezer, new stove, new toaster oven, new silverware & utensils, new pots & pans, dishes & glassware, soap basics & paper towels, full spice rack, new 12 -cup coffee maker & electric kettle with a cupboard filled with yummy teas & coffee just waiting to be sipped on our “panoramic patio”! 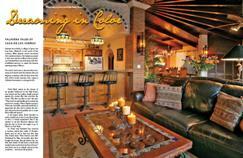 We’ve been featured in Baja Lifestyle magazine! Email us to find out if the dates you want are AVAILABLE, then reserve! 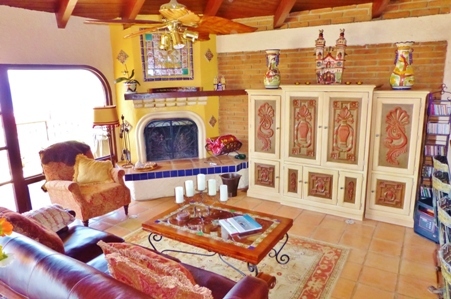 Interested in having a design of Mexican Tiles on your casa? Each tile has its own personality – each tile welcomes you home.